In the last two decades, the world has arguably been in the midst of the greatest communications revolution since the development of the telegraph. Dubbed the ‘Internet revolution’, the new communications medium has fundamentally altered how people produce and consume information, knowledge, and culture. Like the telegraph before it, the Internet was made possible not only because of the technology, but also because of government intervention and regulatory choices that created and spurred investment in the new network. Major constitutive choices by the government included the original research and development at DARPA, the National Academy of Sciences investment in building the backbone, the insistence on open standards, and the Clinton administrations decision to privatize (Benkler, 2006). However, the phenomenal growth of the Internet has increased its salience to the national economy, national security, and trade relations. Increasingly, in an effort to gain more control over the network, national and international regulatory regimes are seeking to constrain the network, raise the costs of network participation, and control the medium, potentially limiting how information, knowledge, and culture are exchanged in a free society in the process (Benkler, 2006). 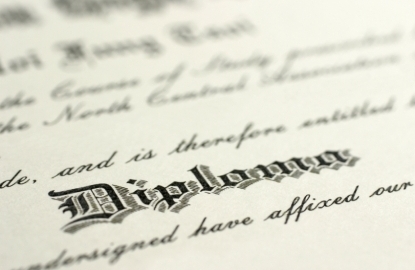 Examples include the passage of DCMA, the failed SOPA/PIPA legislation, and the upcoming International Telecommunications Union conference seeking to introduce an international regulatory regime. This author is concerned that regulatory efforts seeking to introduce government gatekeepers into a decentralized medium may stifle innovation and have negative implications for freedom of expression and participation in the networked public sphere. The aim of this policy paper is to examine the range of policy approaches to regulation of the Internet. Section I of the paper will define the issues surrounding Internet regulation by analyzing three different policy perspectives. Section II will analyze various policy positions as a coherent whole, while section III will recommend a policy position that deals with the legitimate social and economic concerns of Internet regulation, while being supportive of a digital ecology that encourages innovation and freedom of expression in the networked public sphere. Government regulation is critical to the protection of the public interest (Shafritz, Russell, & Borick, 2011). In the case of the Internet, the public interest can broadly be conceived in social, political, and economic terms to include users of the Internet, commercial entities whose businesses are either enabled or threatened by the Internet, and the government itself, that must consider Internet regulation in national security, foreign policy, and international trade terms. The basic contours that shape the Internet regulation debate can be defined broadly as freedom versus constraint in several important dimensions, including b) freedom of expression versus copyright protection, b) innovation versus oligopoly, and c) borderless Internet versus territorial sovereignty. Each dimension has particular arguments in the freedom versus constraint debate, and specific legislative and regulatory choices that will shape the future of communication. The Internet and computing technologies have dramatically expanded the ability of traditional consumers of mass media content to become content producers, by dramatically lowering the costs of creation and distribution to nearly zero (Shirky, 2009). As such, a variety of new forms of information, knowledge, and culture have arisen including blogs, mashups, viral videos, animutations, and more serious work such as open-source software development and Internet documentaries, most which rely on individual creative expression in non-market models and often build on or use other works to create something entirely new. While the Internet has enabled consumers to become producers, government regulation is beginning to place constraints on would be consumer/producers. In October of 1998, President Clinton signed the Digital Millennium Copyright Act into law, a constitutive choice “to tilt the institutional ecology in favor of industrial production and distribution of cultural packaged goods, at the expense of commons-based relations of sharing information, knowledge, and culture” (Benkler, 2006, p. 418). Critical elements of the law include the retroactive extension of copyright protection to material already in the public domain for the sake of international copyright harmonization, and anti-circumvention provisions that outlaw technologies that circumvent copyright protection measures put into place by copyright owners (U.S. Copyright Office, 1998). These measures were put into place based in the idea that strengthening copyright protection in the digital realm would spur the release of content onto the Internet based on the protections afforded by the law to the media and entertainment industry, however the law also attempts to influence the non-commercial conduct of users (Sparks, 2001). In an analysis of an early DCMA case, Universal City Studios vs. 2600.com, Sparks (2001) questions the implications of the new copyright law on freedom of expression, finding that while the DCMA will limit digital copyright infringement, it also has the ability to interfere with the exchange of content over the Internet and the free expression of computer scientists seeking to advance the state of the art. The case in question revolves around the release and distribution of DeCSS software on the hacking website 2600.com. At issue, is whether the reverse engineering, development, and distribution of software to make encrypted DVDs playable on open source Linux software was in violation of the anti-circumvention provisions of DCMA (Sparks, 2001). The court ruled the DeCSS was “not subject to constitutional protection sufficient to exempt it from regulation under the DCMA” (Sparks, 2001, p. 8), nor was the DCMA consider too broad, rather it was narrow in terms of the harm it sought to prevent. However, Sparks (2001) argues that the court’s interpretation of DCMA is overly broad, given “that it prohibits programming with substantial non-infringing uses and purely academic exchanges on encryption/decryption that do not actually infringe on protected copyrights”, (p. 18) in absence of damages, and merely on the speculation of potential harm. In this sense, the law is seeking to prevent the development of technology that would allow infringement, rather than enforcing infringement when it occurs. Moreover, Sparks (2001) warns that DCMA “may have the unintended effect of limiting the availability of the means of protected free expression” (p. 19). The implications of Spark’s (2001) analysis suggest serious potential harm to free expression on the Internet. First, any technology development that deals with encryption or decryption technology on the Internet, by non-market or market actors could be subject to DCMA enforcement depending on interpretation, irrespective of whether actual infringement or harm occurs. Second, the government is attempting to regulate barriers to technical progress in Luddite fashion, in an industry notable for a rapid rate of change. Finally, the law favors market actors over non-market actors, the media and entertainment industry over the software industry, and media oligopolies with aging business models over innovation in the media and entertainment business. Despite the intention of DCMA to constrain innovation in order to protect copyright works, the genie was already out of the bottle. Where DCMA sought to prevent the reverse engineering of DRM encryption to protect the DVD market, the development and rapid growth of peer-to-peer file sharing technology threatened the business model of oligopolistic media firms in an entirely new way. The basic contention of the media industry is that P2P file sharing is akin to piracy, and is therefore illegal and immoral, despite the legitimate use for file sharing in other contexts (Benkler, 2006). As such, the industry has mounted fierce legal attacks on early file sharing technologies wherever a central point existed, such as with Napster’s architecture, resulting in Napster’s eventual demise. However, P2P technologies evolved into architectures that lack any point of centrality, in a completely distributed architecture, resulting in phenomenal growth of consumer/producer usage, estimated as much as 450 million downloads every week (Currah, 2006). Currah (2006) attributes the counterintuitive behavior to the nature of market incumbents versus niche competitors, arguing that niche competitors are attracted to emerging markets given the opportunities for growth in unseating competitors, while incumbents are incented to protect and grow large markets in a risk averse manner. Tushman and Anderson (2004) describe these behaviors in terms of the processes of exploration and exploitation, where incumbents have little incentive to explore new markets, rather when emerging markets mature, incumbents can simply consolidate the market given their broad industry power and control of assets. The implications of Currah’s (2006) study is threefold. First, oligopolistic firms are incented to exploit existing markets and suppress innovation. Second, P2P technology used in legal form has the potential to reduce the high costs of media distribution to practically zero, potentially forming the basis for a new business model with lower costs and greater reach. However, while most studios acknowledge the potential, none appear willing to bear the risk of innovation (Currah, 2006). Third, the battle between media companies and P2P technologies is merely the first foray into a broader need to insert points of control into the decentralized network medium. One aspect of control is the DCMA regulation that extended copyright protection and attempts to protect DRM technology, providing ‘unprecedented power’ to oligopolistic firms. More concerning is that battle lines are drawn firmly with the media oligopoly and the state on one side and consumers/producers on the other, centering “on how we create, fund, use, own and share creative works in a digital and networked economy” (Currah, 2006, p. 463). Put in simpler terms, it appears that media companies and the state might prefer active consumer/producer participants revert back to passive consumers. In the early days of the Internet, many considered the Internet a virtual world, wholly separate from the physical world, and as such predicted international regulation might be difficult if not impossible (Benkler, 2006). The reasoning was twofold. First, the Internet is essentially borderless, insofar as information can appear simultaneously in multiple jurisdictions (Bauml, 2011). Second, the Internet is decentralized, lacking jurisdictional choke points, rendering the question of jurisdiction difficult to address (Benkler, 2006). However, early predictions about national government’s ability to regulate the Internet have proven to be overblown (Goldsmith, 2000). Instead, national governments are legitimately able to introduce regulation of the Internet in their jurisdictions, however not without challenges. Goldsmith’s (2000) analysis attempts to put the problem into perspective by analyzing the conflict-of-law problems inherent with unilateral regulation, arguing that unilateral regulation, while not desirable, is equally an effective vehicle for enforcing the norms of sovereign territories. Goldsmith (2000) argues that regulation is legitimate insofar as “international law permits a nation to regulate the harmful local effects of foreign conduct” (p. 138). Moreover, Goldsmith (2000) acknowledges that while regulation of the Internet is imperfect, it remains an effective form of control, particularly through efforts to regulate the demand side of Internet participation. Furthermore, in making the case that the impact of unilateral regulation is overstated, Goldsmith (2000) suggests that because most Internet content providers will necessarily lie outside the enforcement jurisdiction of most national regulation, the ability of many regulatory bodies will be hampered in the enforcement of local laws. Therefore, “the entities potentially subject to multiple Internet regulations are users, systems operators (especially Internet access providers) and transaction facilitators (such as banks and credit card companies) with a presence in more than one regulating jurisdiction” (Goldsmith, 2000, p. 140). It follows that national governments have an ability to regulate the activities of most multijurisdictional commercial firms, while perhaps having a minimal effect on content providers without a presence in the local jurisdiction. However, while Goldsmith (2000) addresses the legality of unilateral regulation, the author fails to address the potential social and political implications. This author agrees that the basic arguments on legitimacy and efficacy are sound. However, the author concedes the primary way that a government regulates an activity is “by raising the activity’s costs in a manner that achieves desired ends” (Goldsmith, 2000, p. 138). Moreover, Goldsmith (2000) argues further, that content providers are responsible for assuring their content does not cause harm in other nations, and should insert geographic coding, another way of raising costs. Of course, costs are the heart of the matter. The Internet has dramatically lowered the costs of producing information, knowledge, and culture, lowering barriers to participate in the medium (Benkler, 2006). Raising the costs of participation is one way that governments and commercial entities can attempt to shape the Internet into a controlled mass medium where only well-funded entities can participate. Indeed, higher costs, in the form of taxes is at issue in the upcoming International Telecommunication Union meeting in Dubai, where a draft proposal of new international telecommunications rules include a clause that allow national authorities the right to tax all incoming and outgoing Internet traffic (International Telecommunications Union, 2012). The U.S. government is unanimously opposed to the draft proposal, arguing “the Internet does not need new international regulations… such regulations could be devastating to Internet freedom and economic development” (Essers, 2012, p. 1). Of course, the U.S. government may not be exclusively concerned with Internet freedom as much as the economic impact of such regulation. The effect of national government taxation would be to exact revenues from Internet content providers like Google or Facebook for traffic associated with their page requests (Pfanner, 2012). The Internet’s growth in economic, political, and social importance coupled with the global nature of the Internet will likely make international regulation a fact of life in one form or another. Furthermore, the costs of such regulation may impact users beyond the borders of the national regulatory regime implementing the regulations, and have a broad impact on the participatory nature of the Internet. U.S. and international society face unprecedented constitutive choices regarding the future of arguably, the most important medium in human history, “a new information environment, one in which individuals are free to take a more active role than was possible in the industrial information economy of the twentieth century” (Benkler, 2006, p. 2). Furthermore, Benkler (2006) describes this moment in history as one of both opportunity and challenge in a period of choices regarding the ‘institutional ecology’ of the digital environment, an ecology made of up the laws and regulations that will define the degree to which individuals are able to participate. The opportunity, as Benkler (2006) defines it, is to shape the ecology in such a way as to safeguard the individual freedom, use the Internet as a platform for improved democratic participation, and “achieve improvements in human development everywhere” (p. 2). In the broadest sense, the Internet is a powerful force for the advancement of liberal ideals. Not liberal in the sense of alignment with a political party, rather liberal as befitting a free person. Therefore, the constitutive choices faced in Internet regulation policy remain the degree to which constraint is chosen over freedom across the myriad issues at play. At question is how much constraint is required to deal with legitimate political, economic, and social concerns, while protecting the freedom needed to encourage continued innovation and freedom of expression in the networked public sphere. Therefore, the lens through which to evaluate policy options is the balance between freedom and constraint. Of course, a key question is how to evaluate the balance between freedom and constraint? Given the networked information economy has threatened the control of dominant incumbents of the mass media era (Benkler, 2006), evaluating the degree to which a policy or regulation seeks to introduce controls that support powerful incumbents over rights that protect new market entrants or individuals can illuminate whether the policy options favors freedom or constraint. As discussed previously, the DCMA extended copyright protection for works already in the public domain in the interest of international harmonization (Sparks, 2001), a protection that extended the rights of media firms and limited the rights of individuals seeking to use those works in the public sphere. Moreover, DCMA limited the exchange of information deemed as potentially harmful to media companies by making copyright infringement possible, despite potentially legal uses of the information, and the fact that there was no evidence of actual infringement (Sparks, 2001). Both described elements of DCMA enhanced the protections afforded market incumbents at the expense of individuals. Some might argue that the public good was achieved through DCMA, by protecting the media industry DVD distribution model and the rights to monetize copyright works; a compelling argument. However copyright and patent law exists to encourage contributions to the public good by allowing a creator to monetize their investment for a limited period of time to encourage economic growth and innovation. In this situation, the law was used to allow incumbents to cling to an aging business model, limiting the rights of innovators, like P2P developers, in the networked information economy. Another example worthy of examination was the recent attempt to pass the controversial Stop Online Piracy Act and its companion bill in the U.S. Senate, the Protect IP Act. Both sought to prevent infringing activity perceived to harm U.S. economic interests by enabling broad enforcement measures (Band, 2012). The legislation was intended to stop “three kinds of infringing activity: copyright infringement, counterfeiting, and circumvention of technological protection measures” (Band, 2012, p. 3). The main controversies surrounding SOPA and PIPA had to do with the enforcement measures that may have been overly broad. The law would require intermediaries such as Internet service providers, payment systems, search engines, and advertising networks to block access to alleged infringing websites within five days of receiving notification of infringing activity (Band, 2012). The problems raised by the law include issues of due process, the use of controversial IP blocking techniques linked with censorship in authoritarian regimes, the potential of the law to negatively impact legitimate websites, and the concern that the law would create an incentive for commercial Internet business to monitor usage, perhaps invading privacy in the process (Band, 2012). The controversial law was supported most notably by the pharmaceuticals industry, and the entertainment industry (Band, 2012), industries with a high degree of market concentration concerned over protecting their dominant position and business models. Certainly, infringing activity is an important economic concern of the U.S. government, however the legislation as designed did not seek to achieve an appropriate balance between copyright protection and freedom of expression and provided overly broad power to copyright owners. Balance, of course, has always been the intent of copyright law, a “balance between the respective values of supporting creative pursuits through copyright protection and promoting innovation in new communication technologies by limiting the incidence of liability for copyright infringement” (“Metro-Goldwyn-Mayer Studios Inc. v. Grokster, Ltd,” 2005). SOPA and PIPA appeared to favor enhancing the protections of a few industries at the expense of freedom of expression and innovation. A final example is the proposed ITU clauses concerning the right of national governments to tax inbound and outbound network traffic. As previously discussed, taxation raises the costs of Internet use and can lead to harmful effects for Internet users by raising the barriers to participation on the Internet. However, the relationships between freedom and constraint are less clear as the context shifts to national actors on the international stage. Some consider the Internet to be a U.S. dominated medium that is used to further U.S. foreign policy interests in the Middle East and elsewhere. For example, the U.S. State Departments Internet Freedom project provides circumvention and anti-censorship technology to activists inside repressive regimes (U.S. Department of State, 2012). Moreover, the concentrated U.S. power over the medium allows the U.S. to dominate Internet governance and associated trade policies (Revie, 2012). It is little wonder that foreign governments are seeking to attenuate U.S. Internet power through the use of the ITU. In one sense, the U.S. government is seeking to strengthen freedom in authoritarian regimes, while foreign governments are seeking to constrain U.S. Internet hegemony. In another sense, the U.S. could be thought of as attempting to constrain foreign governments freedom of self-determination through the promotion of liberal ideals. In any event, the ITU example differs significantly from DCMA and SOPA insofar as the U.S. can be considered a largely unchallenged incumbent, and therefore is not seeking to introduce legislation in either the dimension of freedom or constraint, rather is seeking to avoid international constraints. The predominant character of the Internet regulation reviewed in this analysis is oriented towards constraining the interests of individual Internet users or innovators to protect powerful incumbents. There are other policy options that are oriented towards enabling the rights of society to participate in the networked information economy, such as the right to Internet access, network neutrality rules, or the right to develop municipal wireless networks. However, the U.S. has legislated none of these rights, although the FCC has implemented some network neutrality rules. However, those rulings are being challenged in court. Figure 1. 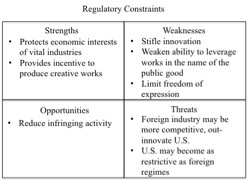 SWOT analysis of regulatory constraints oriented policy options. Figure 2. Policy options oriented to additional legal freedoms. These options are not meant to suggest either-or solutions, rather to contrast the differences in the range of options. Legislation like DCMA or SOPA do little to encourage innovation, rather they protect the status quo in industries that could benefit from competition and change. Although, regulatory constraints on market and non-market activities could significantly reduce infringing activity and encourage market actors to invest more in creative endeavors. Moreover, regulatory constraints could improve the economic growth of industries that rely on copyright protection. Finally, regulatory constraints that limit freedom of expression could place the U.S. on the same moral low ground as more repressive regimes. In contrast, policies that enhance Internet freedom encourage innovation and advance the cause of technical progress. While some industries may suffer from ‘creative destruction’, other industries will benefit from increased participation on the Internet. Moreover, limited regulatory protections could create a more level playing field consistent with free market principles. 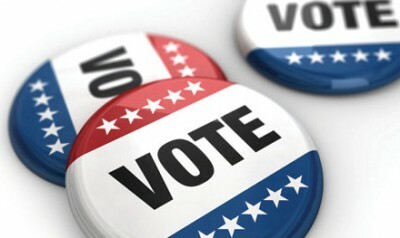 Most importantly, enhanced freedoms could create a more participatory public sphere enhancing the U.S. democratic experience and commensurately increasing the stature of liberal ideals on the global stage. The overriding policy goal of Internet regulation and legislation should be to shape the institutional ecology to stimulate economic growth at a macro-level rather than protect any particular industry, while improving access, encouraging participation, and safeguarding individual freedom. With the basis for a policy position set, this author will define the specific policy proposals, provide support for each, and outline both the benefits and the drawbacks. DCMA has many positive elements, including safe harbor provisions for Internet service providers and Internet content providers. However, the anti-circumvention measure goes too far in attempting to limit technical innovation, suppress legitimate free speech, and provides protection for incumbent industry, that allows them to cling to a business model with decreasing consumer relevance. For this reason, this author recommends revising DCMA to strike the anti-circumvention measure. The consequences of such action would be to force the media and entertainment industry to innovate, either by keeping ahead of technology, or developing new business models that reflect changing consumer preferences for content delivery. Moreover, would-be innovators could advance the state of the art without the fear of criminal penalties because of how their innovation might be used by others. The drawback of striking the anti-circumvention could be that DeCSS technology could be made available to the public and actual infringement may occur. However, the media and entertainment industry could adopt the RIAA’s legal tactics and bring suit against those that infringe the most. Media concentration can sometimes be cause for concern, both in the general sense, as well as in the specific instances where Internet service providers acquire content. In such cases, like with the Comcast acquisition on NBC Universal, there is evidence that the network provider may choose to throttle traffic or guide traffic to their own content, reducing choice and diversity for consumers (Benkler, 2006; Lessig, 2001). The FCC should largely prevent the media concentration of these types of firms or provide extensive oversight to assure that network providers to no hamper diversity and choice through network management techniques or pricing bundles. Moreover, prevention is favored over oversight due to high costs and the low efficacy of independent regulatory bodies. The drawbacks are likely few, given most mergers of this type have typically failed over the long term, AOL/Time Warner being the most notable example. Many municipalities, particularly in rural areas, are seeking to deploy municipality wide broadband wireless networks to stimulate economic growth and attract residents. These efforts have to date been interpreted as illegal in suits brought by traditional media companies or their proxies (Benkler, 2006). Municipal broadband efforts can go a long way towards helping to solve the last mile problem, where 10% of the country still does not have access to broadband. Moreover, broadband can help stimulate economic growth by connecting a community to the larger world, allowing them to take advantage of the strength of weak ties (Granovetter, 1973). Properly channeled, a broadband network coupled with community investment can reinvigorate communities and stimulate economic growth (Intelligent Community Forum, 2012). There is little need to protect the domain of telecommunications providers, particularly when there appears to be little interest or profitability on their part to in build the last mile. The U.S. should exert all of its political and economic force to prevent the ratification of draft ITU clauses that allow national governments to tax incoming and outgoing traffic and raise the Internet participation costs for everyone. First, the idea that Internet content providers should pay national taxes for requests for information from citizens of foreign governments is beyond pale. The idea would raise the costs incurred by Internet content providers, which would have to be passed along to consumers, irrespective of the jurisdiction where they reside. Moreover, low barriers to participation is the reason that so many users of the Internet are able to participate and exercise the right of self-determination, despite the lack of economic power. The Arab Spring is a great example of such phenomenon. Repressive regimes can use taxation as a tool to assure that few of their citizens can participate in the Internet, eroding international freedom and limiting the power of the Internet to improve human development globally. These policies will help to restore the balance between freedom and constraint and level the playing field to assure that Internet freedom remains the right of a free society and free peoples the world over. Moreover, adequate copyright protections remain in place, without stifling innovation. However, traditional industries will be forced to evolve the Internet, rather than attempt to impede technical and social progress by virtue of their market power. In addition, these policies can help prevent the potential negative implications of greater media concentration by keeping production and distribution separate and distinct. Ultimately, these policies may help to keep the costs of participating in the creation and exchange of information, knowledge, and culture low, enabling a more participatory democratic society. 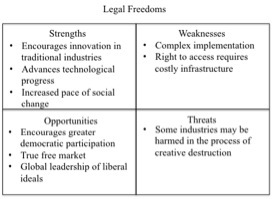 While not comprehensive, these policies can help level the playing field between freedom and constraint by creating the ecological conditions for continued innovation and economic growth from the Internet platform. Band, J. (2012). The SOPA-TPP Nexus PIJIP Research Paper no. 2012-06. Washington D.C.: American University Washington College of Law. Bauml, J. E. (2011). It’s a mad, mad Internet: Globalization and the challenges presented by Internet censorship. Federal Communications Law Journal, 63(3), 697-732. Goldsmith, J. (2000). Unilaterla regulation of the Internet: A modest defence. European Journal of International Law, 11(1), 135-148. Granovetter, M. S. (1973). The strength of weak ties. American Journal of Sociology, 78, 1360-1380.
International Telecommunications Union. (2012). World Conference on International Telecommunications: Draft of the Future ITRS. International Telecommunications Union Retrieved from http://www.itu.int/en/wcit-12/Documents/draft-future-itrs-public.pdf. Lessig, L. (2001). The future of ideas : the fate of the commons in a connected world (1st ed.). New York: Random House. Metro-Goldwyn-Mayer Studios Inc. v. Grokster, Ltd, No. 545 U.S. 913, 928 (2005). Shafritz, J. M., Russell, E. W., & Borick, C. P. (2011). Introducing public administration (7th ed.). Boston: Longman. Sparks, S. (2001). Busting the code: The anti-trafficking provision of the digital millenium copyright act and free expression in digital media. International Journal of Communication Law and Policy(6), 1-20. Tushman, M. L., & Anderson, P. (2004). Managing Strategic Innovation and Change: A Collection of Selected Readings. Oxford: Oxford University Press. U.S. Copyright Office. (1998). The Digital Millennium Copyright Act of 1998: U.S. Copyright Office Summary. Washington DC. Defining moments are ridiculously difficult to predict. For example, President Bush attempted to use ‘defining moment’ rhetoric to pressure the U.N. Security Council to pass resolution 1441, calling for Iraq to disarm what later was found to be a non-existent weapons program (CNN, 2003). Later, President Bush attempted to define a ‘defining moment’ for the Iraqi government in their push to rid Basra of militants (Myers, 2008). Of course, the attempts to define the defining moments of a presidency occur on both sides of the aisle. After the killing of Bin Laden, Democrats rushed to a ‘defining moment’ narrative for Obama’s presidency (Warren, 2011). Despite the efforts of political public relations machines, defining moments remain elusive, precisely because they require the passage of time and the resulting perspective that goes with it, and because they must hold symbolic meaning for larger historical narratives. However, most public relations functions continue to use their skills in an attempt to define moments for those they represent, based on the antiquated idea that media has powerful effects on a mass audience, but many do not consider the meaning-making capability of individual audience members. On May 1, 2003, the American public was greeted with the sight of President Bush, heroically landing on the U.S.S. Abraham Lincoln, fully bedecked in a flight suit, where hours later, under a banner reading ‘Mission Accomplished’, President Bush would announce the end of major combat operations in Iraq (Bash, 2003). While President Bush choose his words very carefully, the banner betrayed the government’s interest in staging a ‘defining moment’ in the U.S. public sphere. Of course, the pseudo-event did become a defining moment, just not in the way it was intended. Rather than ‘mission-accomplished’ becoming a symbol of American military dominance and a capable administration, it became a symbol of an administration out of touch with the reality on the ground in Iraq, and as such, cast doubts on the administration’s ability to win the peace. Bush staffer’s would later argue that message was mangled, that the press got the meaning wrong, and that the banner was not intended to convey the end of the war, rather the end of a successful deployment of the U.S.S. Abraham Lincoln (Bradley, 2011). However, their objections ring hollow, and the event serves to illustrate a public relations function that continues to operate using the notion of the media as “a great keyboard on which the government can play” (Time, 1933). Shafritz, Russell, and Borick (2011) support the idea that governments continue to use the mass media as a device to influence the public sphere. However, the notion of a mass society easily influenced by a powerful mass media, has largely been refuted in research on media effects (McQuail, 2010). An alternative view of the communication process, is the reception model, which has focused communication research on the role of the individual in the social construction of meaning (McQuail, 2010). President Bush and the communications staff of the Bush administration sought to shape public perception of the war effort by suggesting that combat operations were successful and complete. The staff chose powerful symbols of American military might, an aircraft carrier, fighter jets, and U.S sailors. In addition, the staff sought to portray President Bush as an accomplished military leader, having the President fly onto the aircraft carrier on a Navy jet, despite the aircraft carrier being within helicopter range. While it remains unclear whether the ‘Mission Accomplished’ sign was intentionally placed behind President Bush, it is difficult to believe the sign escaped the attention of the White House communications staff. However, history demonstrates that the clearly orchestrated pseudo-event did not shape public perception in the way in which it was intended. Rather, the American public created an altogether different meaning resulting from the public relations disaster. ‘Mission Accomplished’ was not only widely criticized in the press as premature (Andersen, 2007; Bash, 2003; Bradley, 2011), but also widely parodied (Ferell, 2010; The Daily Show with Jon Stewart, 2003). In addition, the phrase became an Internet meme symbolizing incompetence, failure, or disingenuousness (quickmeme, 2012; Urban Dictionary, 2012). The picture that emerges from the widespread use of ‘Mission Accomplished’ demonstrates an altogether different ‘defining moment’ than the one envisioned by the Bush administration. Therefore, public administrators should consider carefully whether to attempt to stage ‘defining moments’ of their own, for public perception is not so easily shaped. Rather, when framing debates in the public sphere, consideration should be made how pseudo-events will play in the larger context of the public debate. While the mass media is an important tool for public relations, the idea that the mass media exerts a powerful influence over public perception has been refuted in studies of media effects. Instead, public relations staff should consider the meaning-making capability of individual audience members and how the symbols that are used support existing narratives in the public sphere. McQuail, D. (2010). Mcquail’s mass communication theory (6th ed.). London ; Thousand Oaks, Calif.
Time. (1933). Foreign News: Consecrated Press. Time. The U.S. retail and food services market was estimated to generate more than $4 trillion dollars in sales in calendar year 2009 (U.S. Census Bureau, 2012). As retailers seek to find ways to gain share of the growing pie, knowledge of shopper perceptions and behaviors are used to build competitive advantage. Increasingly, shopper insights “necessary to understand the shopping experience including shopper need states, shopping occasions, and shopper behavior in-store” (Weber, 2009, p. 1), play a larger role in business planning in the retail and consumer product goods markets. Shopper surveys are an important tool to provide useful insights into the shopper experience that can drive retailer improvements, particularly when supported by statistical analysis. The Springdale Shopping Survey, a telephone survey of 150 shoppers of three community malls, offers key insights into shopper perception that can inform mall marketing, design, and business improvement strategies. How the three areas compare in terms of residents’ general attitudes towards each. Whether residents spend differently at the three areas. The strengths and weaknesses of each area. 1. How the three areas compare in terms of residents’ general attitudes towards each. Table 1. Frequency distributions for variable 7, 8, and 9 of the Springdale Shopping Survey, measuring resident’s general attitudes towards each area. Figure 1. 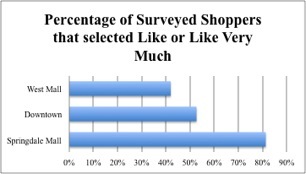 Percentage of Surveyed Shoppers that selected Like or Like Very Much by shopping area. More than 81% of residents surveyed like Springdale Mall, while only 52% and 42% of residents like the Downtown area and West Mall, respectively. Further analysis of the differences between the strengths and weaknesses of each shopping area may illuminate the factors that contribute to resident’s attitudes. 2. Whether residents spend differently at the three areas. Table 2. 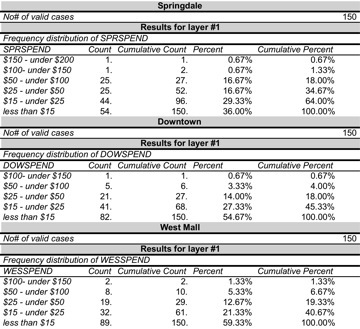 Frequency distributions for variables 4, 5, and 6 of the Springdale Shopping Survey, measuring resident’s spend per trip to each shopping area. The frequency distributions in Table 2 highlight that Springdale shoppers spend the most per visit, with nearly 35% of Springdale shoppers spending more than $25 dollars per visit, compared with only 19% for West Mall and 18% for Downtown. Further areas of analysis should seek to determine which variables, if any, show a strong relationship to shopper spend. 3. The strengths and weaknesses of each area. Figure 2. 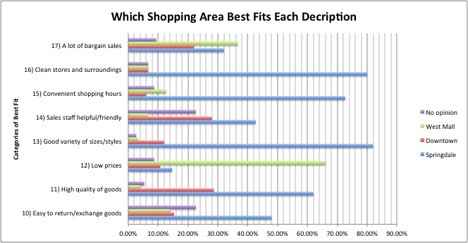 Bar chart summarizing frequency distribution data for variables 10 through 17 of the Springdale Shopping Survey, measuring resident perception of which shopping area best fit the description of each variable. West Mall is likely perceived as the “bargain mall” based on the high percentage of residents that perceive West Mall has low prices and a lot of bargain sales. Although, it is worthy to note that despite the fact that few residents perceive Springdale Mall to have low prices, many still perceived Springdale Mall to have a lot of bargain sales. While not the subject of this analysis, this author’s hypothesis is that resident’s perception of bargains may have a relationship with both price and quality. While Springdale Mall was not perceived to be a best fit for a “bargain mall”, the mall was perceived to be the best fit for many other variables, including clean stores and surrounding area, convenient shopping hours, friendliness and helpfulness of sales staff, good variety of sizes/styles, quality of goods, and ease of returns and exchanges, suggesting that both the Downtown area and West Mall could learn much from the Springdale Mall operation. Further analysis should include the importance of each variable to residents to narrow to specific improvement opportunities. 4. The demographic makeup of survey respondent’s based on gender, marital status, and average age. Table 3. Average age of respondents based on marital status and gender, based on variables 26, 28, and 30 of the Springdale Shopping Survey. Table 3 shows that married respondents tend to be older than single respondents and male respondents tend to be older than female respondents. Future analysis should seek to correlate resident attitudes, perceptions, and spend with resident demographic information to determine the extent to which demographic information is related. Of the three shopping areas in the Springdale community, the Springdale Mall appears to have the mindshare and wallet share of area residents. More area residents like the Springdale Mall over both the Downtown area and the West Mall. Moreover, residents appear to spend more money at the Springdale Mall. In addition, many area residents may consider West Mall a bargain mall, suggesting an opportunity for West Mall operators to target bargain conscious shoppers in future marketing efforts. There are additional opportunities to conduct further analysis to understand which variables are positively and negatively correlated with resident spend, and to determine the degree to which respondent attributes impact attitudes, perceptions, and spend. As retailers devise strategies and business plans to gain a greater share of consumer’s wallets, surveys are increasingly used as a tool to create shopper insights that identify opportunities to improve retailer performance. Analysis of the Springdale Shopping Survey highlights how statistical analysis of survey data can provide shopper insights to inform mall operators in the Springdale area of opportunities to improve mall revenue performance and gain competitive advantage. Likert, R. (1932). A technique for the measurement of attitudes. New York,. U.S. Census Bureau. (2012). Estimated Annual Sales of U.S. Retail and Food Services Forms by Kind of Business: 1998 Through 2009. Washington DC: U.S. Census Bureau Retrieved from http://www2.census.gov/retail/releases/current/arts/sales.pdf. Weber, W. (2009). Shopper insights and shopper marketing: “Getting it right” (pp. 1-4). Memphis, TN: Winston, Weber & Associates. Weiers, R. M., Gray, B. J., & Peters, L. H. (2011a). Springdale Shopping Survey. Australia ; Mason, OH: South-Western Cengage Learning. Weiers, R. M., Gray, J. B., & Peters, L. H. (2011b). Introduction to business statistics (7th ed.). Australia ; Mason, OH: South-Western Cengage Learning. The United States Postal Service is facing serious financial problems because of the arrival of the electronic age and fierce competition from commercial rivals, FedEx and UPS. As the USPS struggles to remain quasi-competitive, even as a subsidized institution, many wonder, whether the USPS is even relevant in this day and age (Rosenthal, 2011). In order to stay afloat amid reduced usage by consumers and business as more communications goes online, the USPS has primarily catered to advertisers with it’s only remaining currency, the addresses of every person in the United States and a captive channel to reach them, in effective becoming a direct mail company (Rosenthal, 2011). Of course, as consumers, most of us receive hundreds or thousands of pieces of junk mail annually, offering new credit cards, value-paks of coupons, and ten-dollar pizza offers, which we throw away or at best, recycle. Miller and Spoolman (2010) suggest waste reduction is a key strategy for dealing with the problems of solid waste and I can think of no greater candidate than junk mail. 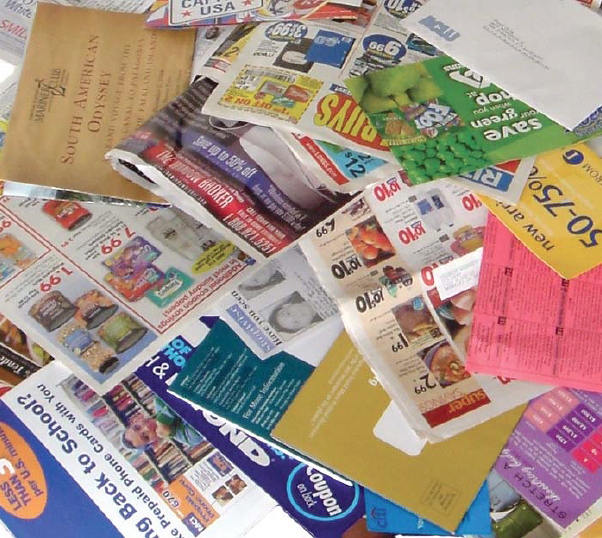 The Native Forest Network (2003) estimates that 100 million trees are cut down to produce 4.5 million tons of junk mail in the U.S. every year, where as much as 40% of it is thrown away unopened. Rosenthal (2011) cited nearly 5 million tons of waste that “costing cities an estimated $1 billion to dispose of it” (p. 1). Instead of continuing to fund an outdated and irrelevant institution, the USPS should be phased out over the next decade, as the country moves the remaining first-class mail online. For the few transactions that cannot be done online, let FedEx or UPS do the job. In the meantime, it is time to stop the useless, wasteful, junk mail industry in its tracks. Some might argue, that businesses could be harmed with the dissolution of the USPS direct mail practice, given that prices for shipping and 1st class mail would likely go up (Orsini, 2011). However, many business are already pushing consumer interactions online to save money on printing and mailing costs, in a bid to be more efficient (Orsini, 2011). We should no longer allow the federal government to monetize its monopoly on the mail service by subsidizing harmful environmental practices that offer little if any benefit to U.S. citizens. And while we are waiting for that to happen, the Native Forest Network (2003) offers several useful tips for reducing the amount of junk mail received. Although, perhaps I’ll just chop down my mailbox. Miller, G. T., & Spoolman, S. (2010). Environmental science (13th ed.). Belmont, CA: Brooks/Cole, Cengage Learning.